Posts Tagged "Key to Dreams"
Home » Posts Tagged "Key to Dreams"
In 1993, The Metropolitan Museum of Art held their first major René Magritte retrospective in 25 years. 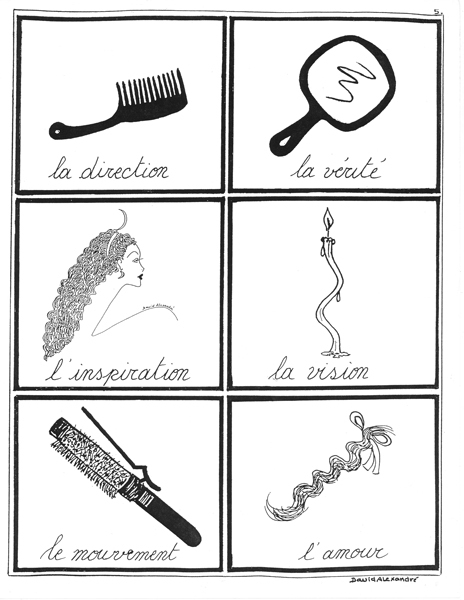 This inspired La Coupe hairdresser, David Alexandre, a Belgium, like Magritte, to work on a series of sketches with Kim Lepine and me for the next press release, to help promote La Coupe’s new tools and how one can be inspired by art. Here, with respect to René Magritte’s “Key To Dreams” (1930), is David Alexandre’s “la direction” with Le Demeloir (La Coupe’s large-size detangling comb) … “l’inspiration” with the long, wavy, off the face V-shaped style worn with a gold headband and crescent decoration (inspired by Magritte’s “The Dress of the Night, 1954) … ” le movement” helped by La Coupe’s Clip Brush for easy volume at a fast clip! … ” la vérité” which tells the truth …”la vision” to light up life … “l’amour” is l’amour.